Goats are my favourite animal (apart from Molly obvs) so before visiting Morocco, there were only really two things that I specifically wanted to see; Jemaa el-Fna and the tree goats. The square was amazing and we got to see it on the day we arrived but the tree goats were supposed to be located outside of Marrakech so I had high hopes for our visit outside of the city at the end of our trip. We were driving for a couple of hours before low and behold, I finally spotted them! These crazy goats hop up into the tree and balance on a branch. It was totally mad to see, just on the side of the road but I was mesmerized and so excited. Apparently I had been talking about it more than I realised because everyone cheered me off of the bus to take some photos which of course I sent straight to Andrew, my parents and anyone else who would listen. Argan trees only grow there in Morocco and no one knows why. They have tried to plant them around the world but they just won't grow so that’s why argan oil is so expensive and also highly sought after; not just by us but obviously the goats love the fruit which is why they are up in the trees in the first place. It is rumored that the goats are where the process of creating argan oil begins; although the women at Coopérative Marjana, (the argan oil cooperative that we were off to visit) collect the seed by hand rather than using ones that the goats have passed which results in a much higher quality oil. At the cooperative, we got to see how the fruit is turned into oil. As we entered the room that they were all working in, the women started to let out some really strange high pitched noises. None of us really knew what was happening but I later found out that this was called barwalá or youyou and it’s just a friendly thing which all added to the atmosphere I guess. We watched as the women all sat together on the floor hammering away at the seeds. The first step was to separate the skin from the nut and then again to crack the seed out of its shell. Behind a glass screen to stop any contamination, the seed was then grinded into a pulp, mixed with a little bit of water and squeezed to extract its oil. And so another life goal was ticked off my list! Morocco, and Marrakech in particular has been on my travel bucket list for as long as I can remember and last week, I was finally able to visit. Whilst I was excited to see the inside of the beautiful riads and eat as much of the delicious food as I could, the one place that I have dreamed of visiting was Jemaa el-Fna and the souks. As we left our hotel (we were staying at Movenpick Mansour Eddhabi) and drove closer, the big roads began to get narrower and narrower until we were driving in and out of side roads and alleys full of little hole in the wall shops. We were dropped off just outside the entrance to the souks and paired up with a guide. Our guy was called Sami and he was super chilled. Walking ahead, he easily navigated us through the maze of stalls as we all trailed behind; stopping in amazement as we peered into each stall. He stopped every so often to let us catch up although we were all cautious to keep an eye on him because if we got lost in there we'd never get ourselves out. The whole market had a very Arabian nights feel to it. Each street was different whether it was intricate lanterns and men melting metal in their shops, mounds of spice piled up high or leather slippers hanging down from the ceiling. You smell those before you saw them! The market is an experience for all of your senses; if you aren't marveling at all of the color, then you are jumping out of the way of a motorbike or trying to ignore the men shouting across for you to come into their shops. It's a very overwhelming experience, but it was absolutely incredible as well! As the market opened out, we finished the souks at a spice stall with all sorts of fragrant, colourful powders piled high. We stopped to look and the man at the stall started mixing up potions and passing around samples for us to smell. We left with a bar of soap and a bag of eucalyptus crystals. The end of the Medina brought us out to the most famous mosque in Marrakech just as the sun was starting to set. 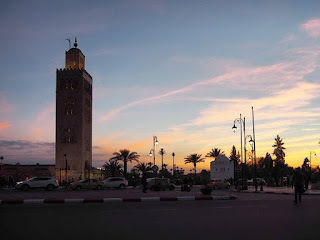 It was one of those moments; watching the sun set over the Koutoubia as we listened to the men inside praying on the loud speaker over the busy streets of Marrakech, that I will remember forever. A bit further down we finally made it to Jemaa el-Fna squre and it was unlike anywhere I have ever seen before. A UNESCO Heritage site, the huge square was full of not only more market stands but storytellers and henna artists too. Smoke from the food stalls and the enchanting songs of the snake charmers filled the air as we walked through. Honestly, it was chaos but what a magical place. We made our way up to the top of Cafe De France and with a cup of ridiculously sugary tea watched as the bright blue sky changed to a fiery red and yellow over the madness below. Dinner later on was a feast of traditional Moroccan food at La Salama. Through a hidden door and up the dark staircase on a red carpet lined with tea light candles, we sat down for tagines with cous cous as belly dancers weaved around us just like the motorbikes before, with trays full of candles on their heads (the style of dance is called Raks al shamadan). After the meal we all got up to join in before heading up to their roof terrace for dessert over looking the square. It was the perfect end to a truly magical day.